While many of us just recently learned of the Great Pacific Garbage Patch floating 1000 miles off the California coast in the North Pacific Gyre, scientists tell us it has been growing steadily since the 1950’s. Birds and animals get entangled in the trash and ingest tempting looking pieces of plastic causing a high concentration of chemicals in our food chain. Weight is estimated at over 100 million tons spanning an area twice the size of the state of Texas. The Great Pacific Garbage Patch even has its own Wikipedia entry. Experts believe 80% of the plastic comes from land based sources while 20% comes from ships. 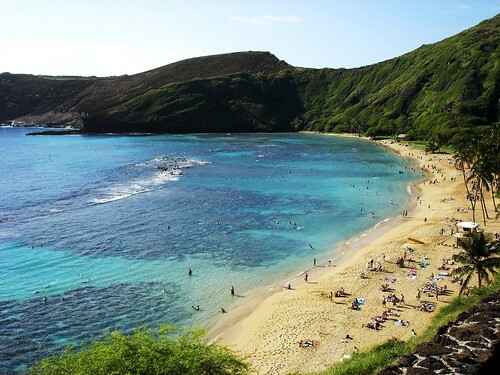 I delighted in taking my kids snorkeling in Hanauma Bay in Hawaii this month. They were wide-eyed as they watched the colorful tropical fish swim arms length away. At all the beaches we visited in Hawaii we found plastic bags and other trash on the shore and in the water. It’s not just Hawaii beaches. We find garbage everywhere we go. While out hiking or geocaching, we take a bag to collect garbage. In fact, the other week I had to buy a tactical backpack to carry our hiking snacks/water in one compartment while filling up the others with beach trash. Cache in – Trash out. Plastic is 100% non biodegradable. It never breaks down. What do you do about this growing problem? Start locally. * Bring reusable bags with you when you go shopping. It’s an easy step. * Reduce your waste. Can you fix it? Repurpose? Do without? Only humans are to blame for this disaster and we are the only ones who can resolve the situation.